Questions for discussion: What does the presence of Jesus in the Blessed Sacrament mean to you? What does the word ‘substance’ mean to you? How is Christ Present in the Bread and Wine? How Christ is present in the bread and wine is possibly the most misunderstood aspect of the Eucharist, so we need to look very carefully into this very sensitive question. I use the word ‘sensitive’ deliberately because I find many people get very upset when the views which they have held since childhood are questioned. However, we can only build our spirituality on truth so let us try to discover the truth as far as the mystery will allow us. I will do my best to present just three of these theological views: through symbols, transubstantiation and sacramental presence. To begin to understand the presence of Christ in the bread and wine, we must go back to the Last Supper, and to understand that we need to look first at the Jewish Paschal meal or Seder meal as it is often called. When I looked up Seder meal on the internet, the first item to come up was headed, ‘Seder Meal Full of Symbols’ – and indeed it is rich with symbols! In this meal there is flat matzo bread to remind the diners that their ancestors had to leave Egypt in haste and could not wait for the dough to rise. There is a lamb bone, a symbol of the lamb that was roasted and shared by the family; green parsley dipped in salt water and eaten as a symbol of the tears shed while in slavery; a mixture of apple and nut to symbolise the mortar used for the bricks made by the Israelites for Egyptian buildings; horseradish, a bitter herb, to symbolise the bitterness of slavery, and roasted eggs to symbolise the new life the people discovered when they were freed from slavery. The eating of these items is interspersed with readings from the Old Testament, the singing of psalms and other songs, and the drinking of four glasses of wine. It is a joyous festive family celebration. The Seder meal was the meal that Jesus celebrated with his followers on the night he was betrayed. But Jesus made very significant changes to the tradition, and it would be natural for him to continue to operate symbolically as this was the pattern already established in the Seder meal. It would also be natural for those present to understand his words and actions symbolically and this would be quite unconscious on their part. They would not have had to say to themselves, “Now I must understand this symbolically rather than literally.” We have to do this because over the last several centuries, perhaps due to our scientific upbringing, we have taken a much more literal approach to Scripture which we now need to correct. Take this, all of you, and eat of it: for this is my Body which will be given up for you. Then each took a piece of the loaf and ate it. By this symbolic action, Jesus was foretelling that just as the bread was being eaten by the disciples, his body would be taken and disposed of by the rulers who wanted him out of the way. Take this, all of you, and drink from it: for this is the chalice of my Blood, the Blood of the new and eternal covenant, which will be poured out for you and for many for the forgiveness of sins. Do this in memory of me. The cup was then passed around so that each one drank from it. By this action, Jesus indicated that in the same way that the wine was being poured out and drunk, his blood would pour out of his body when it hung on the cross. Just as the Paschal meal commemorated the deliverance from slavery, the memorial meal of Jesus’ death and resurrection commemorates how Jesus delivers people from their sins. At both the beginning of the meal and at the end of the meal, Jesus made these prophetic actions as a sign of the offering of his life. Jesus identified himself with the bread that was eaten. He identified himself with the cup of wine that was drunk. The bread and wine became symbols of his body and blood that would be disposed of. Symbolism is an important contribution to our understanding of the manner of Jesus’ presence in the bread and wine at the Eucharist. At the Mass we take bread and identify it with the body of Jesus; we take wine and identify it with the blood of Jesus. As we consume the bread and wine in obedience to Jesus’ request, we remember how he gave his body freely to death and how he allowed his blood to be shed. In his book, Christ Present in the Eucharist, (St Paul Publications, Sydney, 2000), Fr. Frank O’Loughlin takes up this question of identity and symbolism as a way of understanding how Christ is present in the bread and wine. Unfortunately, within the Catholic psyche there seems to be quite a fear of any talk of symbols as if symbols are in opposition to the real thing. Yet symbols are powerful and they are real. Carl Jung, the non-Catholic Swiss psychiatrist, said in 1907 that if we lose symbols we lose the sacraments. All the sacraments use symbols. Pope Benedict XVI is not afraid to talk about symbols. He says we have to learn the meaning of the signs and symbols we use in our rites. He goes on to say we must be ‘more sensitive to the language of signs and gestures’. Theologians like to distinguish between signs and symbols. Signs simply give information. For example, street signs just tell you the name of the street. There is no hidden depth of meaning and no emotions involved. A married person treasures his or her wedding ring and can get very upset if the ring is lost. The ring is not ‘just a symbol’. The country’s flag is not ‘just a symbol’. Soldiers will die for the flag. The colours and logos of football teams (bulldogs, swans, tigers) are not ‘just symbols’. The players expend enormous amounts of energy and risk serious injury to have their ‘mascot’ on top of the ladder, while supporters can go berserk when they win a grand final. There is a lot of emotion embedded in symbols, and there can be strong emotion in our sacramental life, as the witness stories in this book attest. Perhaps the best way I’ve heard this matter put comes from my student days at the seminary. One of the professors put it very succinctly: ‘The reality is in the symbol’. For centuries the doctrine of ‘transubstantiation’ prevailed as the explanation of Christ’s presence in the bread and wine, and came to be regarded as ‘quasi-infallible’. Theologians of the middle ages, in particular St Thomas Aquinas, devised a way of explaining how Jesus is present in the bread and wine by the use of the philosophy of the Greek, Aristotle (384-322 BC). It is a marvellously well crafted philosophy and served thinkers well for centuries. The core of the problem for us today is a change in the meaning of words, particularly the word ‘substance’. ‘Substance’ was a technical philosophical term. When I ask people what they mean by ‘substance’ they invariably talk about the material that a thing is made of, whether it’s metal, timber, glass or whatever. What was your answer when you replied to the question about substance at the beginning of this chapter? To say today there is a change of substance in the bread and wine implies for the modern mind a physical and chemical change, a change from the material of bread and wine to the material of the body and blood of Jesus. This is definitely not what ‘change of substance’ meant for Thomas. In fact, Thomas was insistent that in the Eucharist there is no change in the physical properties of the bread and wine. O’Loughlin points out that the modern word ‘identity’ is equivalent to ‘substance’ in Thomas’ language. This article is The Tablet provoked some letters to the journal. One correspondent suggested that Christ is present in the bread and wine as the meaning is present in a word. To say that Jesus’ body is not physically or corporeally present in the bread and wine is saying what Aquinas insisted on 700 years ago. What I have said above is reinforced by what is taught in the liturgy which is the most important teacher we have. When we eat this bread and drink this cup . . . Therefore as we celebrate the memorial of his Death and Resurrection, we offer you, Lord, the Bread of life and the Chalice of salvation . . . There are many other examples where the word ‘bread’ is still used after the Last Supper narrative. The liturgy clearly teaches that the elements are still bread and wine, though we also call them the body and blood of Christ. How is this possible? Physically and chemically we still have bread and wine. People who are allergic to wheat products can still be affected by the consecrated host. The wine is still alcohol – it is usually fortified wine with 17 percent alcohol – so if Eucharistic ministers find there is a lot of consecrated wine left at the end of Mass, they need to be cautious about drinking the remaining wine if they have to drive home!. When I have given teachings on this matter, some Catholics have become very upset, and I have been accused of destroying people’s ‘simple faith’. I know how they feel. I belong to the Congregation of the Blessed Sacrament and when I first joined in the 1950s, perpetual exposition of the Blessed Sacrament was our principal focus. Everything about this practice was imbued with the idea we were in the physical presence of Jesus Christ the King. 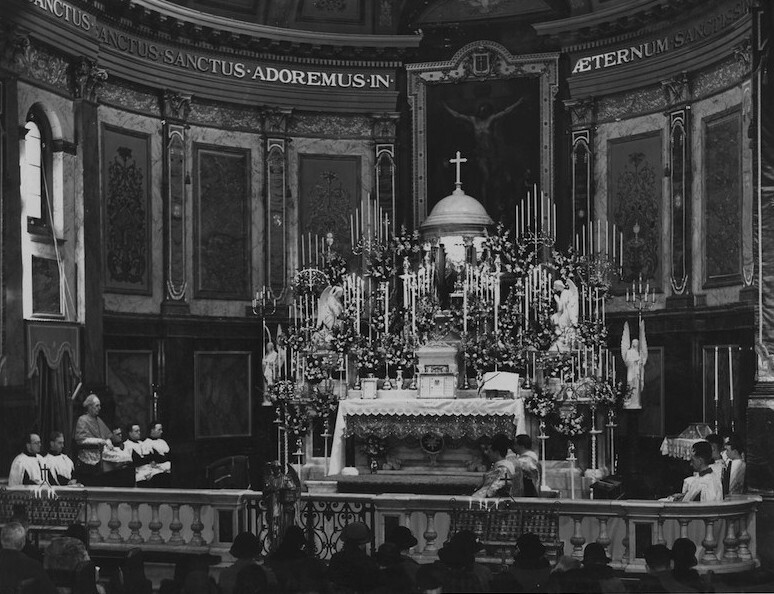 A minimum of twelve candles burned on the altar; the throne of exposition was decorated in velvet and ermine tails in the style of the nineteenth century French kings; we did prostrations on both knees coming into or leaving this presence; we always wore soutane and surplice in the sanctuary. The Blessed Sacrament was exposed on a throne even during the celebration of the Eucharist, and, when the priest had to face the people, he first genuflected and moved a little to one side before turning around so as not to turn his back on the Blessed Sacrament, and when he turned to face the altar he genuflected again to the Blessed Sacrament. It has been a major revolution for all of us in the Blessed Sacrament Congregation to move away from these exaggerated practices which we took for granted at the time. Some members were so upset by the changes they left the Order feeling the charism of our founder, Saint Peter Julian Eymard, had been betrayed. To substitute ‘sacramental presence’ for the ‘physical presence’ seems to be opting for something less than we had and, understandably, people feel let down. Having worked through the pain of discarding this static view of the of the Eucharist which arose in the Middle Ages as discussed in Chapter 1, I now understand much better the reality and, I would say, the beauty of the presence of Christ in the bread and wine. Please note that I have not said the presence of Christ in the bread and wine is ‘only a symbol’ or a ‘just a metaphor’. The words ‘only’ and ‘just’ are quite inappropriate as they downplay the importance of symbols and metaphors. We are ultimately dealing with mystery, and symbols and metaphors are tools that we can use to try to probe a little into the mystery. We do not talk about the body of Jesus in the bread and wine; it is the body of Christ, who died and rose again. When the bread is shown to you at the moment of receiving communion, you are told ‘The body of Christ’, not ‘The body of Jesus’. I’ve heard ministers of the Eucharist say, ‘I’m taking Jesus to a sick person’. I suppose we need not get too pedantic, but I feel this kind of talk indicates a less than accurate understanding of the sacrament. The physical body of Jesus is now at the right hand of the Father in glory. Jesus is not a lonely prisoner in the tabernacle as an earlier spirituality was fond of saying. As adults we must grow in our faith and understand it better, and we need good theologians and mystics to help us. Saint Anselm (1033-1109) said, ‘Theology is faith seeking understanding’. We have the faith; may we keep seeking the understanding. And while seeking the understanding, let us use the whole brain for this: the right brain which deals with imagination, poetry and symbols and the left brain which deals with logic and rationality. Do we need to keep on calling Christ’s presence in the bread and wine ‘the real presence’? This seems to imply the other presences, in the assembly, in the presider and in the Word, are not real. It also leads to unfair statements such as, ‘Protestants don’t believe in the real presence’ as though Catholics have a monopoly on the genuine presence of Christ. I deal with this more in Chapter 16, The Eucharist and Ecumenism. From the point of view of the 2000 year history of the Church the phrase ‘real presence’ is a relatively recent term coming from the late Middle Ages. I prefer to call the presence of Christ in the reserved bread in the tabernacle the ‘abiding presence’. At the synod of bishops in Rome in October 2005, some of the delegates called for a definitive teaching of the Church on how Jesus is present in the bread and wine. This may never happen but while we are waiting, let us be content with the paradox, ambiguity even, of calling the elements of the Eucharist both ‘the body and blood of Christ’ and ‘bread and wine’. After all we are dealing with mystery, and mystery necessarily includes the unknown and paradoxical. No language could be adequate, ever, to explain this mystery of faith. That language breaks down under the burden of mystery is not peculiar to the matter in hand but is a characteristic of all language employed in theology. Of necessity, theological language teeters permanently on the brink of nonsense. Alban McCoy’s comment is a fitting way to conclude this difficult chapter.